We continue our quest to reach 40,000 Facebook "likes"! 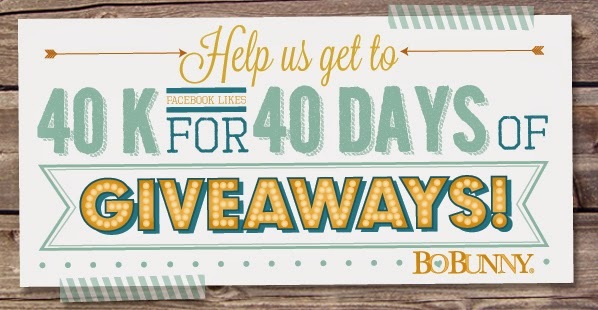 Help us get to 40K by sharing our pictures and encouraging your friends to "like" us on your social media outlets, so that we can bring you 40 days of fabulous BoBunny giveaways. Which of the new collections are you most excited about?! Be sure to vote on our Facebook page, because you get to decide which of the collections we will preview first! Gabrielle here to share a couple of cards I recently made with the beautiful Primrose collection and Bo Bunny's fabulous Kraft Wood Shapes. I love how the neutral color of the Kraft Wood works so well with whatever colors you chose to design with. For this 'blank' card (I sometimes like to leave some cards I create without a sentiment so that I can just add it as I need it), I used a couple of pieces from the new 'Elegant' Kraft Wood collection. Instead of using the frame design as something to mount my title on, I used it as a base design for my handmade rose bloom (made from Primrose 'Breathtaking' paper). I used one of the wood flourish pieces as a design element tucked under the lip of the patterned paper. I did a little bit of inking behind the piece to make the design pop a little more. 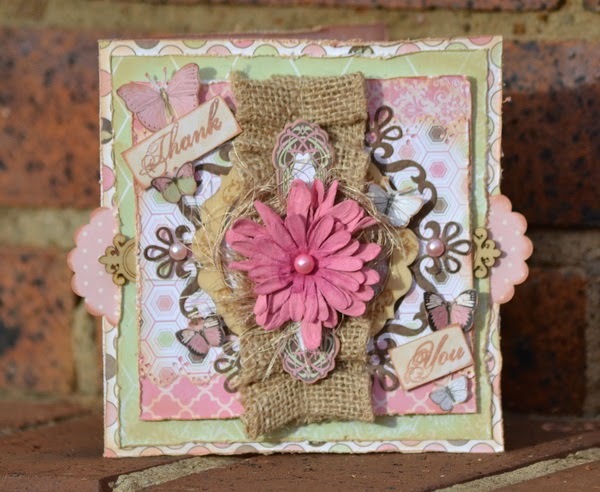 For my second card I used the same paper collection and Kraft Wood Elegant Shapes pack. For this one I wanted to go a little more 'artsy' so I did some inking and misting and a whole bunch of stamping. I even added few strips of washi tape. I used one of the elegant frames to frame the greeting card title and used one of the flourish designs to add a little 'flow' to my fussy cut butterfly. When I use natural elements like wood in my projects, I love to team them up with other natural elements like hemp, twine and burlap. For my first card, I used the Pop Quiz Collection which is perfect for those school projects you may have in mind. This card would be a great idea to slip into your childs lunch box for the first day of school, just to let them know you are thinking about them. This close up shows the Kraft Wood Shapes showcased individually on each square. I added a red button to the apple and tied some string through it. This next card can be an all occasion card, so I didn't add a title to the cover. But I rolled some die cut roses and I will just call it the rose card. I fussy cut some butterflies fron the 12x12 sheet as well as the 6x6 sheet from the 6x6 paper pad. I created 2 very different cards, one for my neice, who will be having a birthday in couple of months, and the other a Thank You card. One being young and fresh and the other more classic and elegant. I always like to try and keep a few cards on hand, because with life being so busy, it helps to have a few made cards made, so should you need one in a hurry, you can just pick up and go! 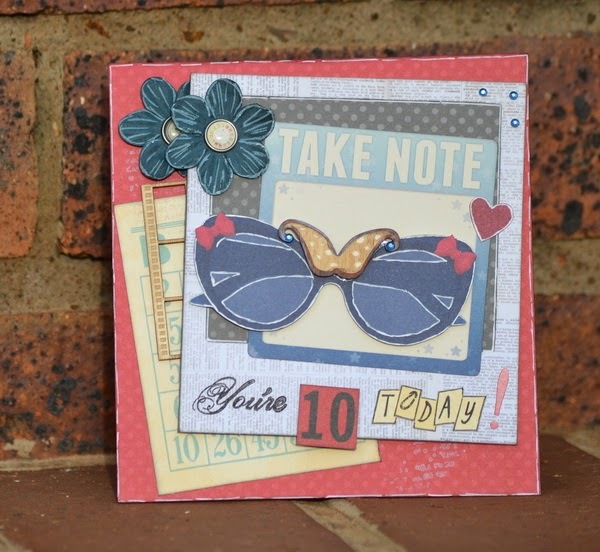 I used Modern Miss for this birthday card, as I love the young and fresh look of this collection. 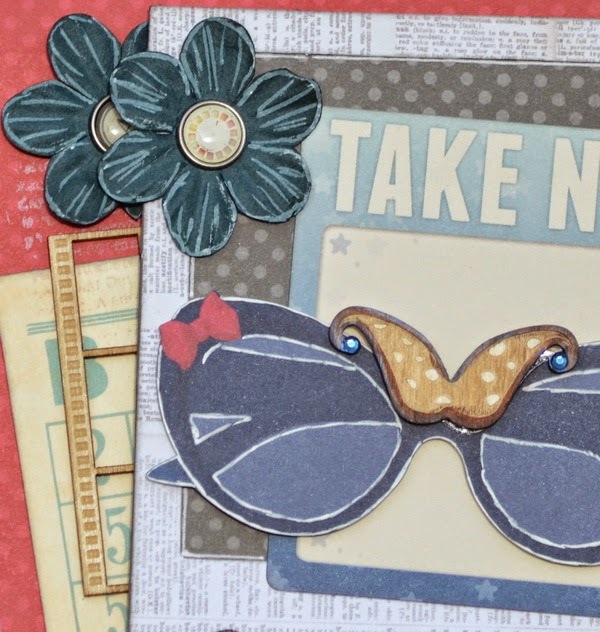 I cheekily also used a Kraft wood mustache, which I inverted, to give the glasses a bit of a retro 60's feel! 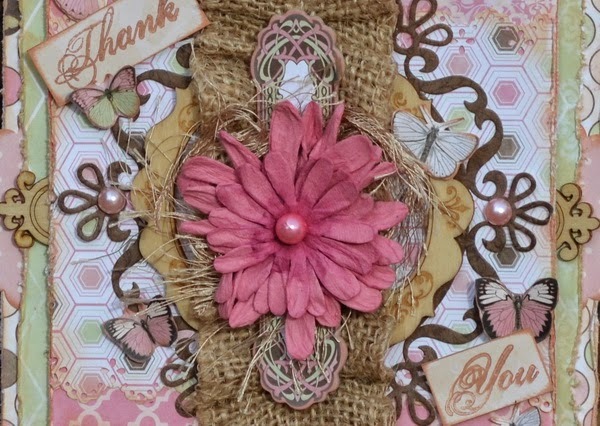 For the Thank You card I used the beautiful and gorgeous Primrose Collection. This is really such a stunning and soft collection and it just is so easy to create beautiful projects, when the papers are so beautiful. I used lots of layers and textures and this gives the card depth and interest. I too am a non-facebook user, but wanted to cast my vote for Lemonade Stand. Love the bright colors and possibilities. I love Bo Bunny products and have used them for a long time and always look forward to new releases. Please don't forget those of us who follow you only on the blog !!! Oh these projects are amazing!